The fastest growing web career path has to be full-stack development. This covers everything in web development from the frontend(HTML/CSS/JS) to the backend(programming + databases). If you’re daring enough to attempt full-stack development then you’ll want some resources to help you get started. In a previous post I covered books for the MEAN stack but that’s merely one way to go. But if you want a more well-rounded collection then these books are sure to whet your appetite for full-stack resources. His book is only 200 pages long bt it covers absolutely everything you’d want to know. The writing style is very direct and super easy to read. 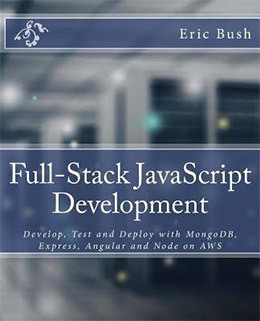 If you follow the direction to setup a Node/Mongo environment you should have no trouble learning the ropes of fullstack development. 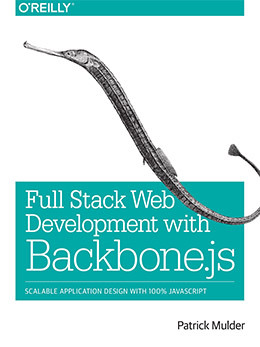 But one downside is that this book uses Backbone.js as the frontend framework of choice. I can’t say this is horrible, but very few devs opt to use this technology anymore. So it depends where you stand on coding but if you’re willing to work with a handful of JS libraries this book is a nice play to start, albeit a touch out of date. In this book you’ll learn about the separate layers including the details of the presentation layer with Angular. You’ll learn how to build a RESTful webapp from scratch including how to scale it and deploy this live on a real server. Configuring a custom Node server is definitely more detailed than running a LAMP stack. But with these instructions you should have no problem getting started fast and learning the ropes with ease. I also recommend grabbing this book if you’re looking to pick up the all-JS dev environment that many coders are moving towards. Without a doubt the most popular frontend framework has to be Facebook’s React.js. I also shared the best books on this library in another post since it’s so detailed. But you can combine React with tons of related technologies to create a powerful full-stack environment. 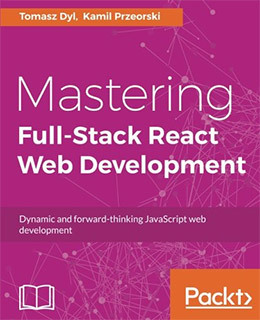 And that’s exactly what you’ll learn in Mastering Full Stack React Web Development. This book teaches you how to combine ideas and create webapps that run smooth regardless of the stack. You’ll learn about common coding mistakes that most people make along with techniques for using Redux in your everyday workflow. I do recommend having at least some experience coding React before you grab this book. It can get technical real fast and it teaches you about related libraries that connect into React’s shadow DOM. Still an excellent resource to take your skills to the next level with a library that’s clearly growing in popularity. I mentioned React in the previous post but didn’t mention that it’s also part of a full-stack environment called MERN: MongoDB, Express, React, and Node. 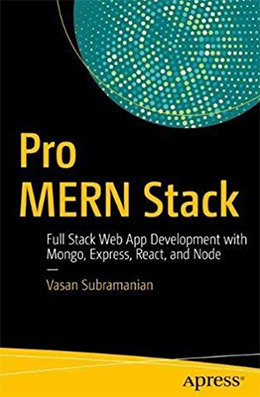 If you’re big on React and want to learn the complete full-stack environment definitely grab a copy of Pro MERN Stack by by Vasan Subramanian. This book is the best guide on this topic with 330 pages of setup guides, sample projects, and common pitfalls to avoid when using this stack for a live project. You’ll learn a lot of the basic concepts while also delving into detail for things like security and maintenance. There aren’t too many people talking about MERN but I think it’s one of the coolest stacks out there. I absolutely recommend nabbing a copy of this book to teach yourself how this ecosystem works. 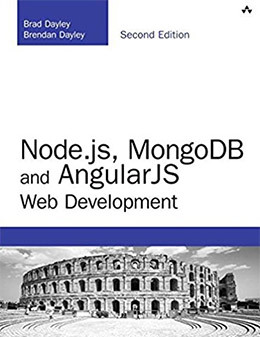 Currently in its 2nd edition is the massive Node.js, MongoDB and Angular Web Development. This book spans 700 pages with hundreds of lessons and simple exercises to follow along with. Learning Node/Angular is a complex subject on its own. Each library has minor nuances that can blend together if you know how to use them. But adding Mongo into the equation can make this even more confusing. The final chapter thrusts you into a custom project with an ecommerce shopping cart where you’ll combine everything you learn. This is by far one of the best full-stack books you’ll find with a huge variety of tools and learning materials inside. Just because everyone’s learning full-stack JS doesn’t mean you have to go that route. Full-stack development is only about learning the entire stack which just requires a simple backend language. This could be PHP, or Python, or in this case Ruby using the RoR framework. 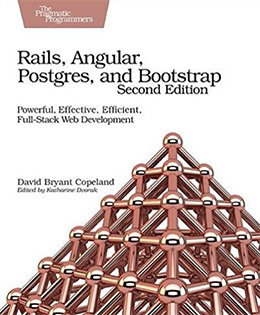 If you’re open to that kind of stack then check out Rails, Angular, Postgres, and Bootstrap by David B. Copeland. It’s an extremely detailed guide to the entire setup using Bootstrap on the frontend along with Postgres for a database engine. If you already know a bit of Ruby then this book will take your skills far above what you could’ve imagined. I do not recommend this for complete beginners since it requires a good amount of patience to work through these lessons. Try to find a simple Ruby programming book first since that’ll help a lot. But overall this is a great full-stack guide for anyone avoiding the all-JS trend everyone seems to love. Not too many developers are using Backbone these days which makes it somewhat of a legacy system. And that’s exactly why this book is so valuable: Backbone is still here and older systems won’t be dropping it anytime soon. 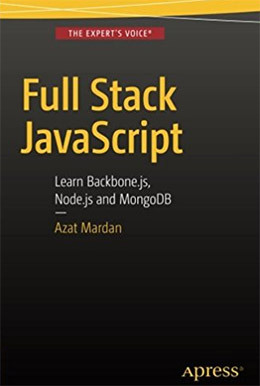 Full Stack Web Development with Backbone.js is the best guide for sysadmins and programmers who need to maintain legacy systems with Backbone.js. It covers the fundamentals of a Backbone app and what you need to consider before adding new features. Through various exercises you’ll also learn how to plan new applications from scratch. This is valuable so you can understand design patterns and full-stack workflows. However I wouldn’t specifically use Backbone to create new applications, so just keep this in mind as you go along. I also think this book could be a great no-pressure intro to coding the full stack environment. However with Backbone on the decline it probably won’t be as useful in a few years, so the real audience is for legacy coders maintaining BB systems. The open source JS platform Meteor is one of the best full-stack solutions on the web. It’s also incredibly complex and does require a good amount of practice to nail down. 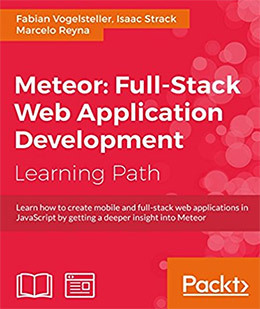 You can shave a lot of time off your workload by reading through Meteor: Full-Stack Web Application Development. This massive book comes with 65 pre-built recipes you can study and rework on your own. The writing style is easy to follow and it helps explain each recipe in plain English so that anyone can understand. You’ll learn about routing, Meteor packages, and database manipulation for scaling larger apps without bottlenecks. I’m incredibly impressed by the quality of this book and the depth(680+ pages). For such a small project like Meteor you wouldn’t think someone could cover this much detail. But that’s what makes this title a must-have resource if you ever want to master the Meteor framework. 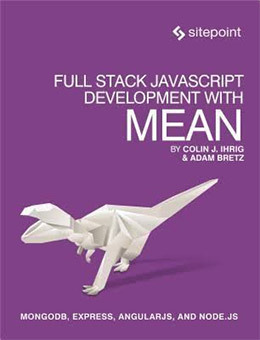 By far the most popular fullstack environment has to be MEAN. With the rapid growth of npm it seems like most web developers are learning a little bit of Node, if not a whole bunch of it just to get by. I’ve seen a lot of MEAN coding books and this one is definitely a solid option for beginners. You can learn so much just by skimming the early chapters and following the exercises step-by-step. 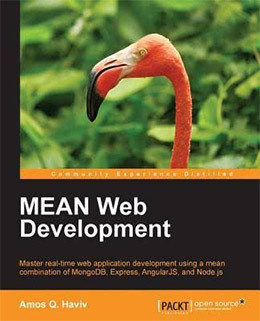 One other pricey-yet-worthwhile book I recommend is MEAN Web Development. This one is much larger and gets into the nitty-gritty of a MEAN stack. I can only recommend this to serious coders who want to make a living out of MEAN development. Some devs who are passionate about Node and want to create smaller webapps may also enjoy this book. However it is dense and not an easy guide to work through. Yes you’ll learn a lot if you put in the effort but it definitely isn’t for the typical newbie. MEAN workflows are constantly advancing so books can go out of style fast. Still I think MEAN is the future and if you’re ready to ride that wave then you’ll want a copy of this book. All full-stack developers know that there’s a lot to learn and you’re never done learning. That’s why these books are merely the tip of the iceberg and will only take you so far. If you want to mix it up with a cleaner programming language try the Ruby-based Rails, Angular, Postgres, and Bootstrap. You could also dive into PHP or Laravel if you’re hoping to work with a full-stack PHP application. There are no wrong choices so once you know what type of stack you wanna do you can just grab whatever books interest you the most.